The Rock Steady Farm in Millerton, N.Y., was founded in 2015 as a cooperative with the goal of growing healthy food for New York City’s marginalized LGBTQ community. Maggie Cheney watered her short tomato plants as she walked through a humid greenhouse at Rock Steady Farm and Flowers, a 12-acre farm in Millerton, N.Y., a two-and-a-half hour drive north of the city. In a few weeks, the tomatoes, along with bushels of strawberries, napa cabbage and ground cherries, will make their way to nonprofits around New York City, like the Callen-Lorde Community Health Center. The organization provides health and support services to LGBTQ individuals across the socioeconomic spectrum, performs outreach in the city’s poorest neighborhoods and offers sliding-scale fees for low-income individuals and people without health insurance. 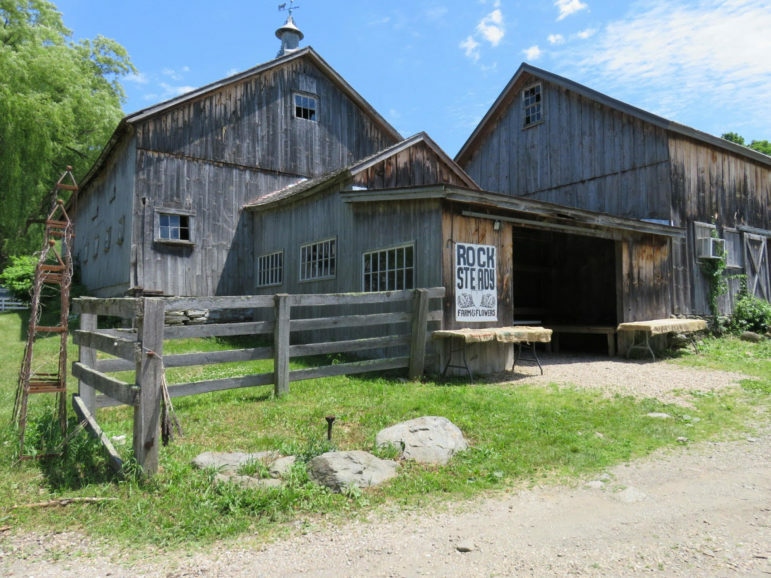 Cheney co-owns Rock Steady, which she describes as “a women- and queer-owned cooperative rooted in social justice.” The farm’s centuries-old barn sits at the base of a wooded mountain a mile from the Connecticut border in Millerton (population: 950). The nearby pond that irrigates the rows of tomatillos and field lettuce once served as a deep iron quarry that filled with water after miners struck a subterranean spring. Cheney, who grew up on a farm and managed an urban agricultural program in Bushwick, says she co-founded Rock Steady in 2015 with a $180,000 loan from the Working World. The founders planned to run a profitable, sustainable cooperative. They also decided to grow healthy food for New York City’s marginalized LGBTQ community. To accomplish that goal, the farmers adapted their nascent Community Supported Agriculture (CSA) program to organizations that serve low-income, LGBTQ individuals last year. Unlike farmers’ markets, which provide a venue for farms to sell food on an item-by-item basis, CSAs charge members an upfront fee for a weekly or biweekly batch of produce, eggs and meat. The CSA season usually lasts for about 20 weeks between late-Spring and mid-Fall. A significant upfront cost — often between $500 and $700 — enables farmers to purchase seeds and equipment in preparation for the season but often prevents poor New Yorkers from participating. So do social barriers and stereotypes. While many LGBTQ individuals certainly reflect the stereotype of CSA members as white and wealthy, the partnership between Rock Steady and Callen-Lorde aims to also reach community members, like Latino immigrants in the Bronx, who are not traditionally served by CSAs. The Rock Steady CSA is just one of several programs around the city that aim to overcome the stereotype of farm-shares as luxuries for wealthy liberals by connecting marginalized communities with local farms in spite of obstacles like federal policies, displacement and destructive weather. At about 11 a.m. on a warm Wednesday morning in June, D. Rooney, another Rock Steady Farm co-owner, parked a burgundy conversion van outside Callen-Lorde in Chelsea to kick-off the CSA season. Rooney crouched in the back of the van and handed pre-packaged produce boxes to staff and volunteers from Callen-Lorde and Just Food. Last year, Callen-Lorde and Rock Steady organized a small, pilot CSA for staff members in order to figure out logistics. This year, they decided to include clients. The first shipment contained 32 boxes stuffed with strawberries and thyme, lettuce and rutabaga, which the team arranged on a folding table in the building lobby. They reserved six of the boxes for the health center’s most marginalized individuals: patients with HIV/AIDS involved in Callen-Lorde’s intensive care coordination (ICC) program. The team also set another five boxes aside for anyone with an EBT card interested in purchasing fresh produce without signing up for a season-long share. Brigham says Callen-Lorde managed to purchase 10 total shares for its ICC patients through a $2,500 donation from Broadway Cares. In addition, other CSA members agreed to pay more so that the CSA could price the SNAP boxes at a lower rate. Traditional Rock Steady CSA members pay $550 for 22 weeks of produce. Cheney said the LGBT Center, another nonprofit partner, used a payroll deduction to withdraw the money from participating staff members. As the team finished setting up the boxes, staff dentist Michael Allison waited to collect his produce, which he emptied into a canvas bag so that Rock Steady could reuse their boxes. After Allison, case worker Hannah Nugent picked up food for herself and a Bronx-based client, 57, who has HIV and struggles with his diet. “We’ve been working on nutrition counseling and this was a good opportunity to learn about eating healthy,” Nugent said. Throughout the morning, staff members and clients studied the boxes as they passed through the lobby and asked how they could purchase the produce. On the first day, five people bought the $35 boxes with cash, including one man who says he would have used his food stamps had he not left his EBT card with his boyfriend. Roughly 1.62 million New York City residents received SNAP benefits in February 2018, down from a peak of more than 1.9 million in December 2012, according to data from the city’s Human Resources Administration available on the city’s Open Data site. Given that high proportion of SNAP-recipients, connecting farmers with low-income communities often depends on their ability to accept food stamps. In 2010, a City Limits report found that 20 of the city’s 90 CSAs accepted food stamps. Though Just Food alone now coordinates about 120 CSAs citywide, the number of locations that accept food stamps has decreased, Director Qiana Mickie says. Based on data from 2017 and 2018, only about 13 CSAs now accept food stamps, Mickie says. She attributes the decrease to a federal policy change that makes it harder for farmers to afford EBT readers. The tedious process for documenting and processing payment information also strains CSAs, which are primarily staffed by volunteers, she adds. For years, the United States Department of Agriculture’s Food and Nutrition Services (FNS) agency, which administers food assistance programs and has traditionally facilitated connections between local farmers and food stamp recipients, ran the FNS EBT Equipment Program, which subsidized the purchase of EBT readers and covered set-up costs, monthly fees and wireless plans. In November 2017, FNS abruptly halted the program. According to the Farmers Market Coalition, an organization that contracted with FNS to administer the program and provide the funding to farmers, including CSA suppliers, 1,005 farmers markets and 744 farmers from 48 states, Washington, D.C. and the US Virgin Islands participated in the program between 2014 and 2017. With the program suspended, farmers face steep upfront and monthly costs that may prevent them from accepting food stamps. In some cases, New York State has filled in the funding gap by subsidizing the cost of a non-wireless card reader and printer worth $509 plus shipping, the $109 program license, $120 annual processing fee and 15 cent SNAP transactions for 335 farmers markets and 140 farmers, says Diane Eggert, executive director of the Farmers Market Federation of New York. Cheney says that the federation told her that funding had run out. And without federal or state support, farmers must pay up to $1,200 for an EBT reader in addition to monthly service fees, which Cheney says cost Rock Steady $50 a month for each of their four basic readers. Farmers must also pay a fee of ten to 15 cents per SNAP transaction. Brigham says Callen-Lorde hopes to increase the number of participants who purchase boxes each week with food stamps for $20 — the price is $30 for those who pay cash on a week-by-week basis. But first, staff and volunteers had to figure out how to set up and use the EBT reader provided by Rock Steady. The EBT card reader came with complicated accessories that eventually enabled the CSA workers to hook it up to a computer and gain internet access. The wireless tool was far easier to operate, Mickie says. For the Crown Heights CSA, SNAP remains a vital component of their food program. The CSA operates out of Georgia’s Place, a supportive housing site for formerly homeless adults. Some tenants belong to the CSA, while others benefit from shares purchased by the building’s management company. The CSA organizers manage to work around the EBT reader mishegas by recording food stamp purchases by hand and submitting them to the government for reimbursement, a labor-intensive activity made possible by a dedicated member who handles all the paperwork. The CSA, founded in 2009, strives to stem the pattern of gentrification that has displaced many longtime Crown Heights residents, primarily low-income people of color, says organizer Erin Longbothum. In 2014, the CSA began offering four payment levels based on income. People at the lowest level use their SNAP benefits to purchase their food boxes for $25 a week while those who earn between $46,000 and $65,000 pay $745 upfront for the season. Wealthier members pay about $100 more, Longbothum says. While volunteer chef Maia Campbell demonstrated how to prepare massaged beet green salad, former teacher Linda Stroud discussed her motivation for joining the CSA and picking up her food for the first time that evening. In this case, the food comes from Sang Lee Farms located on Long Island’s North Fork. The farm was founded in the 1940s by Chinese-Americans who grew produce for restaurants in Chinatown. Kwame Eggerton, a freelance sound engineer, says he has remained a member at the CSA since it began in 2009, even after he moved from Crown Heights to Flatbush. The produce also enables him to prepare healthier and more creative meals for his two daughters, he says. Can it come to scale? With funding from the State Department of Health, the United Way of New York City has managed to take a version of the CSA model to scale by delivering fresh food to city pantries via the Local Produce Link program. The City’s GrowNYC Fresh Food Box program also delivers produce to nonprofit organizations, such as supportive housing sites and community centers, but unlike Local Produce Link, GrowNYC sources its fruits and vegetables from farmers throughout the Northeast, Florida and other southern states. Local Produce Link, which began in 2000 as collaboration between Just Food and the United Way of New York City (UWNYC), maintains the connection between a farm and pantry, says UWNYC Program Manager Jennifer Horan. This season, UWNYC took over the Local Produce Link and received $431,000 from the New York State Department of Health’s Hunger Prevention and Nutrition Assistance program, Horan says. UWNYC divides that money among eight farms before the growing season begins, similar to how a CSA operates. The eight farms contracted to deliver a total of 260,000 pounds of produce to 12 hubs that serve as pick-up sites for local pantries. If a farms fails to supply its contracted total, its must repay a portion of the money. At each pantry, participants receive one root vegetable, one leafy green and one seasonal vegetable like eggplant, squash or tomatoes. Each box equals about a pound per week, Horan says. Unlike other initiatives that donate unused, overripe or rescued produce to pantries and nonprofits, the Local Produce Link is not a donation, says Ben Schute, the owner of Hearty Roots farm in Germantown, which has participated in the program for about five years. “Rather than dumping extra produce on pantries through whatever surplus produce is rotting on shelves, the idea is that the emergency food system should also have access to top quality, fresh produce,” Schute says. In May, however, Hearty Roots experienced a major setback that highlights the pitfalls of local agriculture: a violent hailstorm pelted tender crops and damaged greenhouses and equipment. Insurance would not cover the damage, a typical experience for small farmers who grow diverse crops, Schute says. With help from neighboring farmers who provided free seedlings and from CSA members, including some from New York City, who volunteered to plant, Hearty Roots farm managed to get back on track early in the CSA season. They resumed supplying pantries in Flatbush and East Harlem through Local Produce Link earlier this month. Victoria Kamungu, a nun at Trinity Human Services in Williamsburg near the Bushwick border, says her pantry provides for about 120 people a day. On Thursday and Friday last week, the pantry distributed Local Produce Link food boxes containing lettuce, bok choy and kohlrabi — a pale, bulbous root — to 190 people. The unfamiliar offerings foster an interactive experience for pantry-goers, Kamungu says. “When they come here, they share how they cooked the vegetables and we explained what kind of nutrition they’re getting,” she says. “Then it’s up to them to practice and they’re really benefiting.